Media Mail is a cost-effective way to send media materials through the U.S. Postal Service (USPS). You can send books, videotapes, DVDs, CDs, printed music and other sound recordings through Media Mail as long as they weigh less than 70 pounds. What is the Estimated Delivery Time for Media Mail? It can take between 2 to 10 days for your Media Mail package to be delivered to its destination. On Sunday, April 10, 2016, the USPS implemented a postage rate decrease, as a result of which it will now cost less to ship a Media Mail package. Prior to the change, it would cost $2.72 to ship a 1 lb. Media Mail package which will now only cost $2.61. The table below lists the decrease in Media Mail rates for packages weighing up to 25 lbs. If delivery on your shipment is not time sensitive, Media Mail can help save you a lot! If you’re a Stamps.com customer sending a 1-pound package, it will cost $5.75 and up with Priority Mail (using the Stamps.com discount) and only $2.61 with Media Mail. Using Media Mail in this situation will save you around 53% in postage costs. When did the lower postage rates go into effect? The U.S. Postal Service (USPS) implemented the new postage rates on Sunday, April 10, 2016. What mail classes are being impacted by this rate change? Will this decrease impact Priority Mail? No, the USPS Postage Rate Decrease will only impact mailing products and services. The rates for USPS shipping services were already adjusted on Sunday, January 17, 2016. Why is the USPS implementing a postage rate decrease? The 4.3% exigent surcharge that was granted to the USPS by the Postal Regulatory Commission (PRC) in January 2014 is being lifted. This temporary postage rate increase was granted to help the USPS recoup the losses it encountered during the recession. Since these losses are estimated to have been recouped by April, the USPS is implementing a postage rate decrease. Has Stamps.com been updated with the new rates? Yes, Stamps.com’s postage rates are updated in real-time and all postage printed will reflect the new April 2016 USPS rates. Special Note: In order to get the discounted metered mail rate of $0.465 for First Class Mail Letters (1 oz.) and the lower $2.45 Post Office rate for First Class Mail – Parcels weighing 1-3 ounces, Stamps.com customers must upgrade to Version 13.3. Will this decrease impact both mailing and shipping services? Are the rates for First Class Mail Letters decreasing? Yes, the good news about the April 2016 USPS Postage Rate Decrease is that the rate for First Class Mail Letters (1 oz.) will decrease from $0.49 to $0.47 when purchased at the Post Office. Stamps.com customers get the discounted “Metered Mail” rate, which is also decreasing from $0.485 to $0.465. What happens if I already printed my letter with the old rate? The valid postage rate for letters for PC Postage users was $0.485 until April 10, 2016. Any mail printed with this amount can still be used and will be delivered. At this time, Stamps.com will not be accepting misprint or unused postage refund requests for the old rate, but the good news is that your mail should still be delivered as normal. I am seeing a $2.45 rate for packages weighing between 1 and 3 ounces for First Class Package Service – isn’t the Commercial Base rate $2.60? While online rates are typically cheaper than the Post Office rates, prices at the Post Office were not increased during the January 2016 postage rate increase. 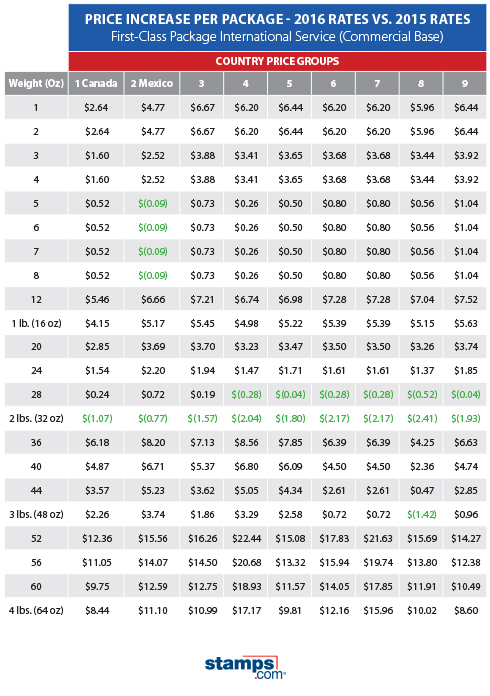 This created an unique situation where the Post Office rate for First Class Package Service parcels weighing between 1 and 3 ounces is cheaper than the online rate (Commercial Base pricing). 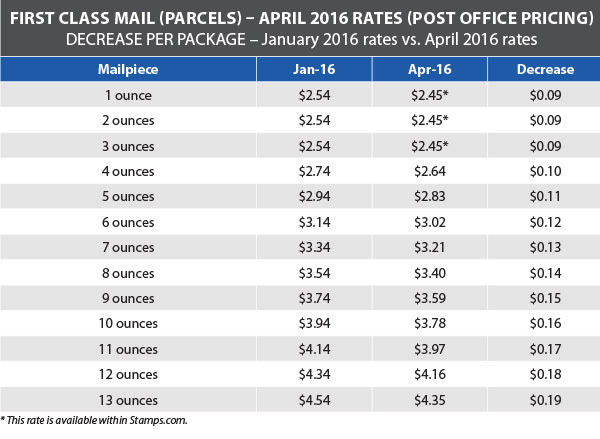 Stamps.com has incorporated this cheaper 2016 Post Office rate into its program! To get this discount, you MUST download Stamps.com Version 13.3. I am seeing a “No Updates Available” message in the Stamps.com Software when I click on the “Check for Updates” link. Why is that happening? In order to receive the lower First Class Package Service rate for parcels weighing between 1 oz. and 3 oz., you would need to download the latest version of Stamps.com, Version 13.3. To update to Version 13.3, please visit www.stamps.com/download. If you go to Help -> Check for Updates, it will say that “No updates are available to Stamps.com software at this time” but there actually is an update available at the special download page. This is required if you want to receive the $2.45 rate. Please make sure to download Stamps.com Version Version 13.3. What is changing with Media Mail? Media Mail rates are decreasing and will now start at $2.61 for a 1 lb. package, compared to $2.72 previously. This mail class continues to be a great cost-effective option to ship books and DVDs as long as quick delivery is not required. Are there any changes for Special Services? Yes, the rates for Special Services have been decreased as well. Certified Mail, Registered Mail, Signature Confirmation and other services are now available for a lower price. These rates are already updated in Stamps.com. Get more details on the decreased rates for Special Services. For the second time in 2016, the U.S. Postal Service (USPS) will be changing its rates on April 10th, 2016. The good news is that this time rates are decreasing for USPS Mailing Services products. – First Class Mail Letters (1 oz.) rates will decrease from $0.49 to $0.47 when purchased at the Post Office. Each additional ounce will cost $0.21. – The discounted “Metered Mail” category for First Class Mail Letters (1 oz. ), which includes online postage providers and postage meters, will decrease from $0.485 to $0.465. Each additional ounce will cost $0.21. – First Class Mail Flats (1 oz.) will decrease from $0.98 to $0.94. Each additional ounce will cost $0.21. – Postcard rates will decrease from $0.35 to $0.34. – First Class Mail – Parcels available at the Post Office will also see a decrease and rates will start at $2.45 (previously $2.54) for a 1 oz. package. Important: While the Commercial Base rate for First Class Package Service for mailpieces weighing between 1 and 3 ounces is $2.60, Stamps.com has incorporated the lower Post Office pricing into its program! So, instead of paying $2.60 for a 1 ounce package, Stamps.com customers will only need to pay $2.45. To get this discount, Stamps.com customers must download Version 13.3. – Media Mail rates will start at $2.61 instead of $2.72 for a 1 lb. package. Why Are USPS Rates Decreasing? Stamps.com will automatically update all USPS rates inside the software and web-based version (Stamps.com Online) on Sunday, April 10, 2016. If you are a Stamps.com customer, no additional actions are needed and you will see the new reduced USPS rates automatically. Special Note: If you want the discounted metered mail rate of $0.465 for First Class Mail Letters (1 oz.) and lower $2.45 Post Office rate for First Class Mail – Parcels weighing 1-3 ounces, make sure to upgrade to Stamps.com Version 13.3. What is Parcel Select Ground? Parcel Select Ground is a ground delivery service from the USPS typically used by large- and medium-sized shippers. The service includes free USPS Tracking and shipping rates are determined by distance, package weight and dimensions of the mailpiece. The maximum allowable package weight for Parcel Select is 70 lbs. Parcel Select Ground can only be purchased via online postage vendors such as Stamps.com or Endicia. If you are a high volume shipper, you can purchase postage directly from the USPS using contract services, however packages are required to be dropped off at a Destination Entry facility. What is the Estimated Delivery Time for Parcel Select Ground? Parcel Select Ground offers U.S. delivery within two to eight days, depending on the destination. The USPS is changing the name of Parcel Select (Nonpresort) to Parcel Select Ground in 2016. For packages weighing between 3 lbs. to 70 lbs. 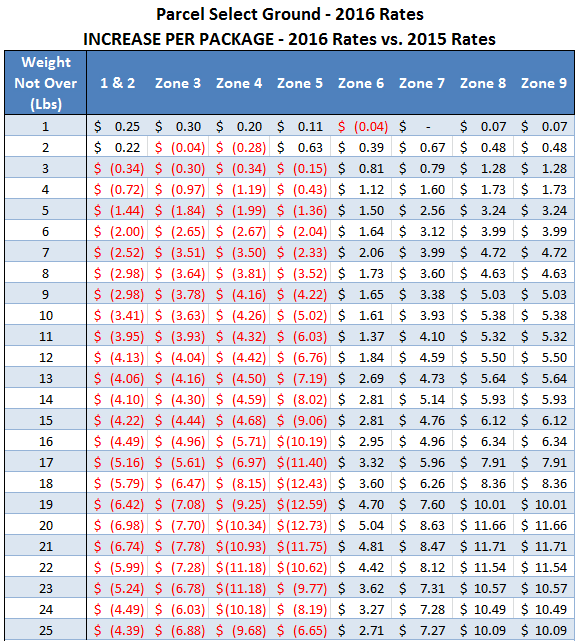 that shipping to Zones 1 – 5, Parcel Select Ground rates are decreasing by as much as $12.73 (20 lbs., Zone 5) per package in 2016. What is First Class Package International Service? First Class Package International Service is the USPS’ most affordable international service for the delivery of small packages to over 190 countries. The maximum weight for this mail class is four pounds, and delivery time varies by destination. Does USPS Tracking come with First Class Package International Service? Yes, USPS Tracking is included for free if a package is being delivered to one of the following countries: Australia, Belgium, Canada, Croatia, Estonia, Finland, France, Germany, Great Britain and Northern Ireland, Hungary, Israel, Latvia, Lebanon, Lithuania, Malaysia, Malta, Netherlands, New Zealand, Norway, Singapore, Slovak Republic, Spain, Switzerland and Turkey. What is the Estimated Delivery Time for First Class Package International Service? Deliveries generally take between 7 to 21 days to arrive at its destination, although the USPS does not guarantee delivery dates or times. First Class Package International Service rates will start at $9.03 to Canada (previously at $6.39 to Canada) for Stamps.com customers. Rates are increasing by an average of 28% for Commercial Base Pricing. For packages that weight 2 lbs., shipping rates a decreasing from 2015 prices by as much as $2.41 (Country price group 8) per package in 2016. First Class Package International Service now offers Commercial Base discounts of up to 5% off Post Office rates (previously 13%). The content on this blog is "as is" and carries no warranties. Stamps.com does not warrant or guarantee the accuracy, reliability, completeness, usefulness, or quality of any content on the blogs, regardless of who originates that content. Call us toll-free at 1-888-434-0055, Monday - Friday, 6 AM - 6 PM Pacific Time.